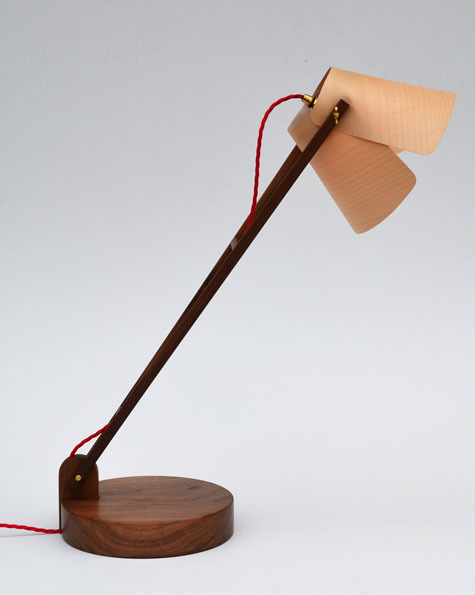 The M77 Desk Lamp is entirely hand crafted from solid walnut with a maple veneer shade. Engineered to be angled for a direct light or an atmospheric glow, the adjustable shade and arms allow the M77 Desk Lamp to be a versatile new design. Complementing the almost entirely wooden lamp are brass fittings and a choice of gold or red braided flex. Please indicate which coloured flex you prefer when ordering.